Rugged mountain scenery and an abundance of wildlife. And when the sun sets, you’ll be relaxing in pure backcountry comfort. Cowboy style. This adventure takes you along the glacier-fed waters of the Bow River, one of the best spots in Banff to spot elk, deer or even moose roaming along the shores. Follow the historic Erling Strom Trail, traveled by renowned explorer Erling Strom in the early 1900s, while taking in awe-evoking views of the Sundance mountain range. At night, the cozy Sundance Lodge gives you a surprisingly comfortable spot to rest your head. Snuggle by the fire, devour gourmet backcountry cuisine and swap tales about the day’s adventures with your fellow riders. Want more time to really soak up the tranquility of the Banff backcountry? On this adventure you’ll spend two nights at Sundance Lodge – a wonderfully luxurious backcountry haven. 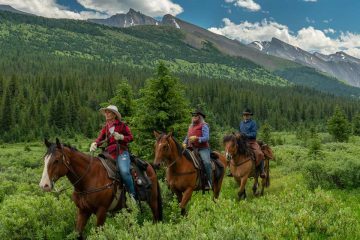 Your days will be spent exploring on horseback and your evenings relaxing in the cozy lodge, sharing delicious hearty meals, delectable desserts and great conversation with your fellow riders. Your adventure begins at 9:30am at the backcountry check-in at the large barn at Warner Stables (please do not arrive any earlier than 9:30am). There’s plenty of free parking at the stables and you’re welcome to leave you’re vehicle here during the trip. Once you’re checked in, you’ll meet your professional and friendly guides and get your slickers and saddle bags. Things happen on “Western Time” here so we may not leave right on the dot and you’ll have time to get to know your horse and ask any questions before you set off. Never been horseback riding before? Don’t worry. We will match you with a mild-mannered horse and teach you everything you need to know. 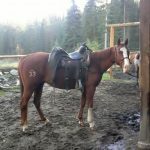 You’ll be surprised at how quickly you gain confidence in the saddle, learn to trust your horse and go from greenhorn to cowboy. One of the aspects of our tours that past guests rave about is the deep connection that they form with their hooved companions. 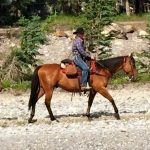 Once you and your horse are ready to go, we will mount up for the 10 mile ride along the banks of the sparkling glacier-fed Bow River, Brewster and Healy Creeks. We’ll stop along the way for a hot lunch on the river banks, then late afternoon we will arrive at Sundance Lodge. This elegant and luxurious lodge offers you a chance to experience the Canadian backcountry, while relaxing in comfort. You’ll arrive to a hot cup of tea or coffee, a warm shower, a soft bed and the friendly greeting of your lodge host. Each host has a way of making the lodge their own, catering in your every need and cooking you delicious meals. Cuddled in your cozy bed at Sundance Lodge, you’ll wake up to the rays of the morning sun streaming in through your window. After a hearty breakfast you can leave your belongings at the lodge and set off unencumbered for a ride deeper into the backcountry with stunning views of the surrounding mountains. On today’s ride you’ll catch a glimpse of the enormous Brewster Glacier and the rock faces of the Sundance Range as you ride along the footsteps of the original pioneers. We will stop for lunch along the trail and enjoy an open-air picnic in this unforgettable setting. At the end of the day, you’ll return to your familiar room at Sundance Lodge, where you already feel comfortable and at home. As the sun sets behind the mountains, you can sit back on the deck and relax, drink wine and share stories and photos with your fellow adventurers. Sundance Lodge is an island of comfort and elegance in an ocean of wilderness, a place where you can admire the rugged beauty of the backcountry while wrapped in soft blankets and sipping from a mug of hot tea. It’s your last morning at Sundance, which is starting to feel like home thanks to the warm hospitality of your host. Be sure to take a few last photos to capture the moment as you prepare to hit the trail again. Wave goodbye as you and your horse saunter back to Warner Stables. It’s another gorgeous full day of riding through wooded hillsides and winding river trails with the soaring craggy peaks of the Rockies as a backdrop. You’ll refuel with a lunch stop along the banks of Healy Creek, where we will enjoy sandwiches, fresh-baked goodies and fruit. We’ll arrive back at approximately 4:30 pm. 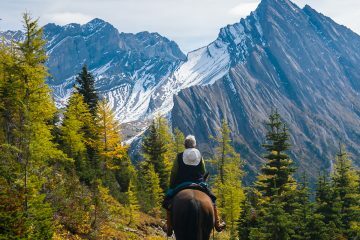 This two night journey is a great way to experience the unspoiled wilderness of Banff on horseback, even if you are only staying for a short time. How long is the tour? The three-day tour commences at 9:30am at the Warner Stables on Mondays, with three full days of riding (approximately 5-6 hours per day including leisurely breaks). The ride returns to the stables at 4:30pm on Wednesday. What does the tour include? The tour includes two nights accommodation at Sundance Lodge and a fully catered menu (2 dinners, 3 breakfasts, and 3 lunches). All bedding is provided. Where is the meeting point? 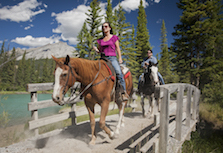 Please meet at Warner Stables, the big red stables located at the end of Sundance Road in Banff. When you arrive, please check-in for your ride at the office in the east barn which has signs for ‘Warner Stables’ and ‘office’. There is plenty of free parking at the site. Please arrive at 9:30am on the morning of your tour (please do not arrive any earlier than 9:30am). A detailed list is available here and will also be provided in your booking confirmation of all items that you should bring with you, including a warm coat, rainjacket, shirts, jeans, riding boots, sneakers, gloves, a scarf, toiletries and a water bottle. 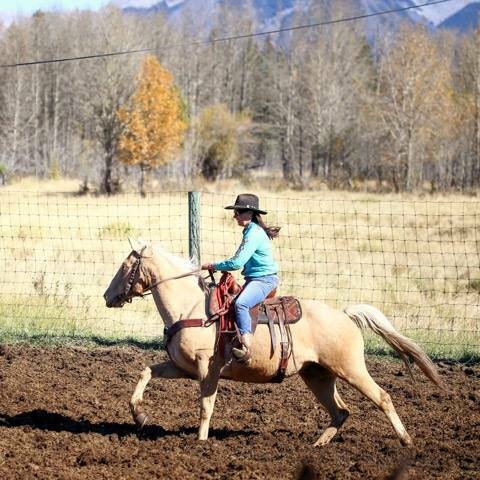 No experience is necessary and if you’ve never been riding before then we’ll be sure to pair you with the perfect horse so you can enjoy a comfortable ride. Our guides will also provide a brief riding instruction prior to the ride. What is the accommodation like? Sundance Lodge is a rustic 10-room log cabin that was built in 1991. Set against the looming Sundance Mountain Range and surrounded by thick woods, Sundance Lodge feels remote and secluded despite being just 16 kilometres (10 miles) from town. The lodge is powered by solar and heated by burning wood and there are indoor washrooms and heated showers onsite. Please note that prices are based on two guests per room, but the rooms have a variety of configurations. A single room supplement is available for an additional fee. Can I bring a backpack on the ride? Daypacks, backpacks or other bags are not allowed, but your rain gear will travel with you on the horse and your guide will help you attach it to the saddle. If you would like to bring saddlebags please fill them with only those essential items that you would need during the day. Fanny packs (a small pack that ties around the waist) also work well. We have a limited supply of saddlebags available free of charge which are available for pick up upon check-in (sorry, no earlier). All backcountry trips are subject to a 30 day cancellation/change policy and no refunds will be given on any trip in progress. In case of unforeseen circumstances we strongly recommend that all guests purchase travel, health, and cancellation insurance prior to their trip. Should I tip my guide? Gratuities are customary and very much appreciated. Rates are based on double occupancy and a single room supplement is available for an additional fee. Guests participating in backcountry riding will need to be 9 years or over and a maximum of 250lbs. 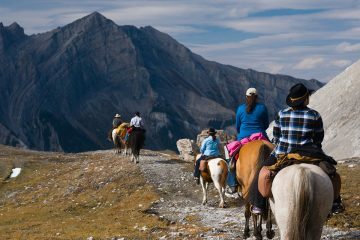 Banff Trail Riders is committed to the health of our horses and the safety of our guests, which means that the minimum age and maximum weight requirements are strictly enforced. As part of the check-in process, guests may be required to confirm their current weight on a scale and provide proof of the child’s age. In the event that these requirements are not met, the booking will be forfeited without a refund. Please note that children will not be paired with an adult – they must ride their own horse. 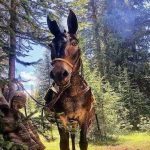 For our foreign visitors we require an understanding of basic English for our horseback rides, so that you can understand simple instructions from our guides. Children aged 15 years and under must have someone 18 years and older with them. For safety purposes helmets are mandatory to be worn by all backcountry riders under 18 years of age. Helmets are optional but recommended for backcountry riders aged 18 years and over. Riders must wear sturdy closed toed shoes – no open toe shoes or shoes with big heels. All adult riders must sign a waiver prior to the tour. A waiver must also be completed by the parent or legal guardian of any rider under the age of 18 (documentation may be required to confirm the signatory’s authority). Riders must be physically capable of controlling the horse during the ride without assistance and for the health and safety of all riders we regrettably cannot accommodate any disabilities or special needs riders. 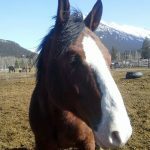 We recognize that disabled riding is a unique and respected skill set that we at the barns do not have the appropriate equipment or skills to safely execute.